Purple Essentials - Natural Skin Care for a pure and simple life! 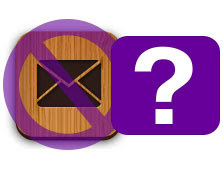 : Having trouble receiving emails from Purple Essentials? Having trouble receiving emails from Purple Essentials? Are you having trouble signing up for our newsletter or receiving emails/notifications/newsletters from Purple Essentials? All email servers have different levels of spam sorting, with live.com, yahoo and gmail being some of the tightest. Too often legitimate, authorized emails from us are being redirected into spam/trash, making it very challenging to communicate with our customers. As well, accumulation of these false redirects also affects how emails from Purple Essentials are perceived by email servers - the more times our correspondence misses an inbox, the more likely it is that our legitimate emails will continue to be sorted as spam. please check your spam/trash folders - notifications from Purple are automated and are sent immediately; they will be there. add us to your safe-senders list (and, please, report our email as "not spam"). If, after this, you are still having issues receiving emails and notifications from us, please let us know and we will follow up further. If you have unsubscribed from our newsletter, but are still receiving it, please let us know and we will quickly resolve the issue. As always, live pure and simple - live purple!